Air Force player Chathurangi Jayasuriya (yellow and black) and Seylan Bank player Tharjini Sivalingam vying for the ball. 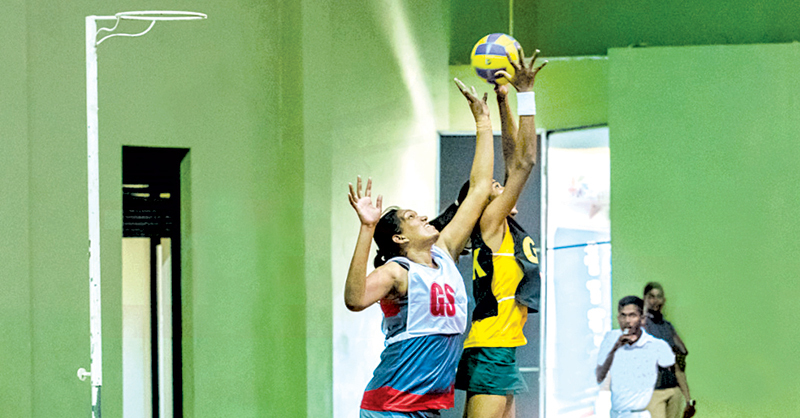 Hatton National Bank booked their final berth after winning two matches in the Dialog National Netball Championship got underway at Rathnawaliya Balika Vidyalaya indoor stadium yesterday. HNB defeated Army SC 55-41 in the 1st match and they took an early 4-2 lead and finished the 1st quarter 13-9. 2nd quarter saw HNB leading by a point going into half time (25-24). In the third quarter HNB widened the gap scoring 10-1 which gave them a 43-33 lead. In the 4th quarter too HNB dominated by scoring 12-8 to seal their victory 55-41. HNB secured their second win against Air Force scoring 51 to 41 points. The second most deciding match between Army SC and Seylan Bank ended up with 71 to 70 in favour of Seylan. Army did not qualify for the next round as Seylan blocked their way. But some controversial decisions by the referees decided in favour of Seylan. Army Coach Hycinth Wijeyasinghe blamed that the match was officiated biased to Seylan Bank and they are going to lodge a protest over refereeing to the Sri Lanka Netball Federation. She further said the match was officiated by a B grade umpire and main umpire also is a player in the Police Netball team. “Also the Seylan Bank head coach Yamuna Sadamali is the head coach of Police SC. We are not satisfied as a B grade referee officiated ‘A” division match. We have lot of qualified referees but why they allowed a ‘B’ grade referee to officiate this important match”. She said.